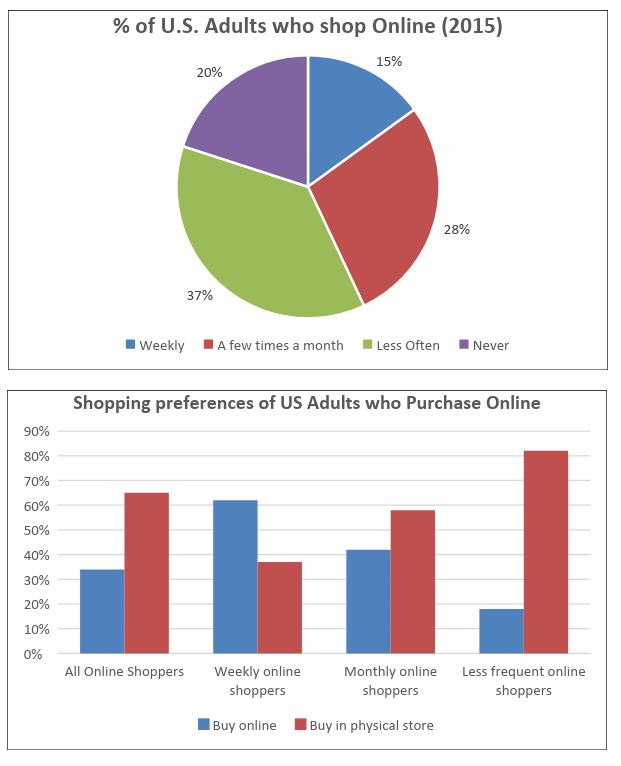 The pie chart below shows the frequency of U.S. Adults’ online purchasing habits in 2015, while the bar chart shows a further classification denoting online purchasing preferences. The pie chart illustrates how frequently adults in the US shopped online in 2015, while the bar chart denotes the shopping preferences of online shoppers that year. All units are given in percentages. Overall, most American adults preferred making a purchase in a physical store, whereas more frequent online shoppers were less likely to shop offline. In 2015, well over half of American men and women bought infrequently, (if ever) on the internet, with 37% stating they occasionally purchase, and a fifth reporting never having bought a thing. More frequent online shoppers included those who bought monthly or weekly at 28% and 15% respectively. Regarding the shopping habits of online buyers, around 65% would still rather purchase at a physical location than online. This trend was most evident among adults who shopped intermittently offline of whom over four fifths reporting making purchases this way. By contrast, almost two in three weekly online shoppers claimed they chose ordering on the internet over leaving the home to shop. The primary trend here is the one that is most interesting. Most media outlines focus on the increase in online shopping. However, the data clearly shows a preponderance of U.S. adults to shop offline. This contrasts with data that shows Americans who bought something weekly online, also preferred to do most of their shopping there too. In 2015, well over half of American men and women bought infrequently or never on the internet. Almost 40% stated they occasionally used the internet to purchase, and a fifth reported having never bought a thing. Give the biggest highlight first. The word “still” is used here since the shoppers who took part in this survey reported shopping online, though they made most of their purchases at physical locations. Rephrase “less frequent shoppers” to “intermittent” ones which defines the same thing and has more conciseness. “Of whom” is a prepositional phrase. Use different ways to signify units: four fifths, two in three, 65%. The pie chart illustrates how frequently adult in US shopped online in 2015, while bar chart denote the shopping preferences of online shopers that year. All units are given in percentage. Overall, most American adult preferred making a purchase in a physical store, whereas more frequently online shopers were less likely shop offline. In 2015, well over half of American men and women bought infrequent, (if ever) on the internet, with 37% stating they occasionally purchase, and fifth reporting never having bought thing. More frequent online shoppers include those who bought monthly or weekly at 28% and 15% respectively. Regarding the shopping habits of online buyers, around 65% will still rather purchase at physical location than online. This trend is most evident among adult who shopped intermittently offline of whom over four fifth reporting making purchases this way. By contrast, almost two in three weekly online shoppers claim they choose ordering on the internet over leaving the home to shop. Look at the pie chart. What is the largest/smallest segment of the chart? How can information be grouped together in order to summarize the results? How do most adults in the US prefer to shop in general? Consider the bar chart. Which way to U.S. adults prefer to buy products: in a store or online? Notice the category on the left is for all online shoppers which gives the overall trend. How does the data in the other categories support this? How does data from the pie chart affect this last result?